I have been sick for the past few days with very little appetite so I was happy to wake up today feeling better and really hungry. I thought about what I wanted for lunch and I kept going back to a pasta with greens so I went through the refrigerator to see what I could come up with. 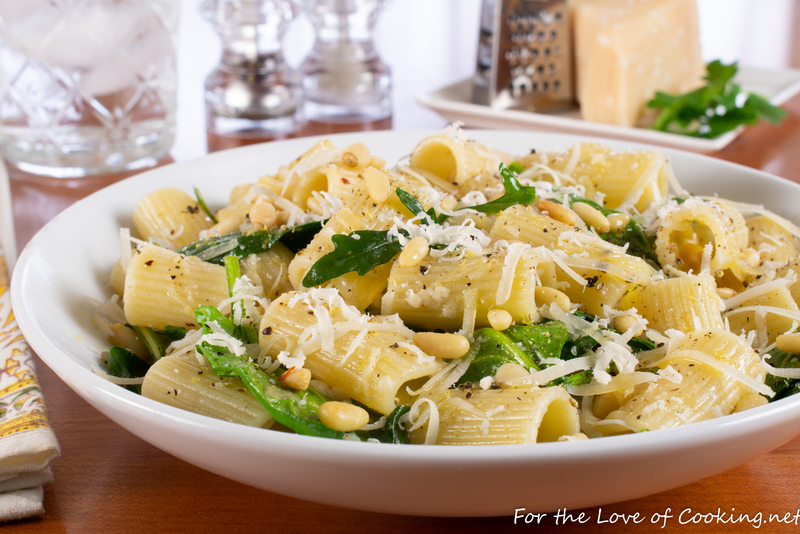 I found a lemon, spinach & arugula, Parmesan, and some pine nuts along with an onion and some rigatoni. Simple, light, and tasty. I threw this recipe together in 20 minutes and it tasted so delicious! I loved the combination of textures and flavors and I was so glad it wasn’t drenched in a heavy sauce. I am excited to eat the leftovers for lunch tomorrow. Cook the rigatoni in salted boiling water, per package instructions, until cooked to al dente. Reserve 1/3 cup cooking water then drain the remainder.